In the early months of 1827, Franz Schubert was in poor health and his financial situation was perilous. He was living in the house of his friend Franz von Schober in Vienna, who placed a small library at his disposal. Here, Schubert discovered the first twelve poems of Die Winterreise by Wilhelm Müller. Fascinated by these texts, he had already successfully set the same author's cycle Die schöne Müllerin, he began setting them to music. It was only in the autumn of 1827 that Schubert found the whole cycle of twenty-four poems in Müller's Poems from the posthumous papers of a travelling horn player, published in 1824. He immediately set these poems too, calling this the "continuation of Winterreise". The gloomy climate of the lieder corresponds exactly to Schubert's mood of the period. Schubert sang to his friends "a cycle of horrible songs", which he said had "affected him more than all those he had composed before". Schubert worked on the cycle with great concentration, but he was forced to make a number of changes under pressure from the publisher; hence several lieder were transposed into different keys to make the set easier to sell. 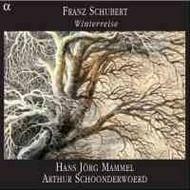 The German tenor Hans Jörg Mammel and Arthur Schoonderwoerd, in this new recording for Alpha, have stuck strictly to the tonal scheme of the autograph, which means all the lieder are sung for the first time in the keys initially planned by Schubert.